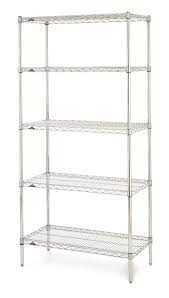 Wire shelving units are the most attractive in the industrial shelving family. They also collect the least dust and debris and allow the most light for accurate visibility. Most commonly, wire shelving units are utilized with standard open wire shelves. However solid panel steel shelves and a wide variety of specialty shelves are available. The basic components of wire shelving units are posts, shelves, and collar locks to support and lock the shelves into place. CSI provides wire shelving units in varying post heights and varying shelf widths and depths. We also offer Steel Shelving, Rivet Shelving, Wide-Span Shelving, as well as Shelving Carts. If you need more storage space within a limited footprint consider Shelf Supported Mezzanines.